Although I enjoy knitting and crafting for special occasions all year long, my favorite knit crafts have always been Easter crafts. One of my favorite things about Easter crafts are all the beautiful pastel colors you get to work with. There are so many beautiful fibers in pretty pastel colorways – I always have trouble choosing just one! Every spring I spend a couple hours at my local yarn shop playing with balls of light, lusciously-colored fibers and try to make up my mind. I always spend way more than I plan, but I have more than enough yarn to make plenty of adorable Easter crafts. Here are some of my favorite easy knitting projects on AllFreeKnitting to celebrate the spirit and colors of Easter. Knit Bunny Pattern – This sweet and cuddly knit bunny pattern would make an adorable knit gift idea for a little girl’s Easter basket. Elegant Easter Egg Cozies – These pretty pastel knit egg cozies are a simple way to add a touch of springtime charm to any room in your house. Bunny Egg Cozy – These sweet egg cozies are a fun, whimsical way to decorate for Easter brunch. You’ll love pulling out these darling little easter crafts year after year. Fuzzy Easter Chicks and Mini Easter Eggs – This sweet little springtime scene is an adorable Easter craft you’ll love taking credit for. 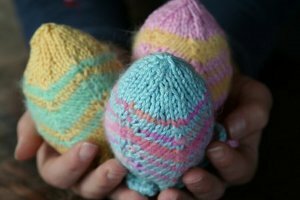 Knitted Easter Egg Decoration – Even more ideas for a cute and easy centerpieces, Easter basket gifts, present-toppers, and wreath accessories. Little Cotton Tails – Any little girl or boy would be thrilled to find these tiny little knit bunnies in their Easter basket this spring. Topsy Turvy Bunnies – Perfect for toddlers, the Topsy Turvy Bunnies are a creative, whimsical take on the traditional bunny rabbit pattern. Bunny Hugs Baby Hat – Dress baby for spring in the adorable Bunny Hugs Baby Hat. This precious knit baby hat is knit in a soft shade of cream and pink for the ultimate Easter beanie. Baby Bunny Newborn Hat – All babies look cuter dressed as animals, and the Baby Bunny Newborn Hat proves it! Bunny Hop Slippers – Prop your feet up in these adorable rabbit slippers. Will you be knitting any Easter crafts? Since Easter is hopping right up to our doorsteps pretty soon it’s important to get together with family and friends. These crafts are perfect for getting everyone involved! The little ones will certainly appreciate the cuteness of their new knit bunnies and chicks friends (Not to say that adults wouldn’t appreciate them as well). Then there’s the fact that everyone loves receiving a homemade gift, so the love will clearly show through every loop you make! Whatever I’m working on now will be my Easter project ! I think I may try to make a few of the easter egg cozies for my nieces. They are super cute. goodness these are some super cute ideas!!! 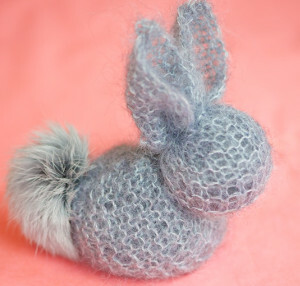 i plan to crochet an easter bonnet…now i’m inspired to knit some eggs!! Oooh, such wonderful projects. I am not sure as to whether or not I will have time to finish any Easter projects, but I will always try! I was wondering where you found the little rabbit tails. I was going to knit some and thought the tails were cute. well easter ie coming and its coming fast go better get ready and you better have something nice for him or her.